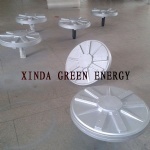 Xinda Green Energy specialized in supply of wind turbine generator, various kind of energy saving permanent magnet generator,speed from 20rpm-6000rpm,power from 1kw to 3000kw, small hydro turbine system, wind solar hybrid system, electric motors, street lamp and so on in global market. Our partner manufacturers are committed to continuously improving our operations and meeting the needs of our customers through innovation and new product development. We work closely with them to optimize the performance and cost-effectiveness of their processes.